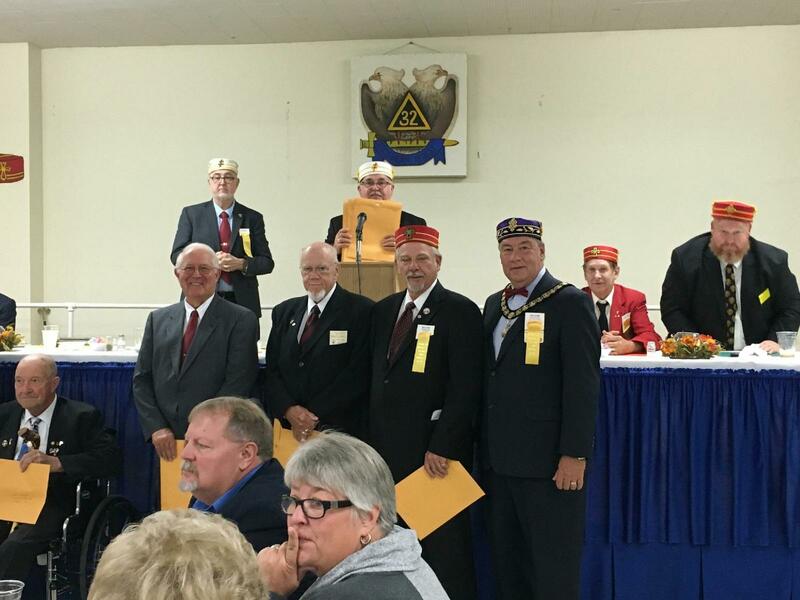 Among those receiving service awards in 2016 at the Valley of Covington, Ancient and Accepted Scottish Rite, are Brothers Garry Kelly and Ed Tanner from Elvin E. Helms No. 926. Both of these esteemed Brothers have served 50 years in the Scottish Rite. 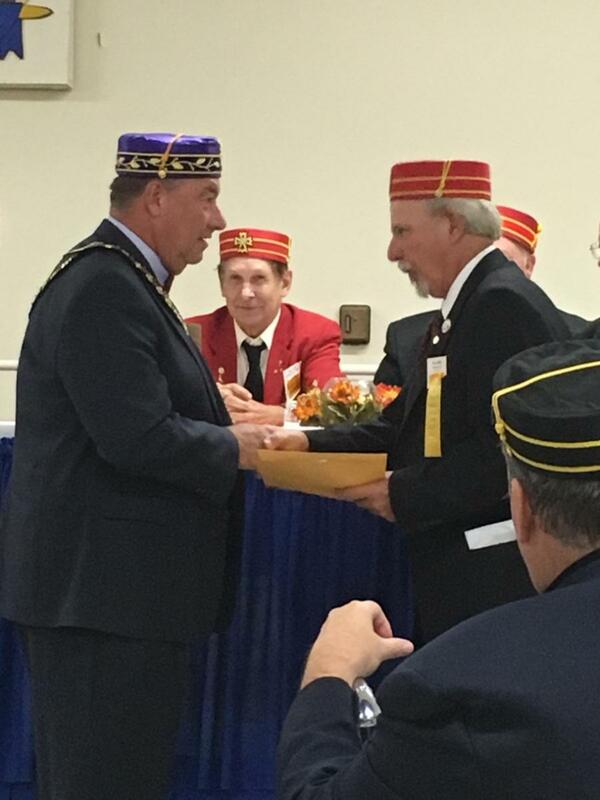 Pictured above, Brother Ed Tanner, KCCH (Knight Commander, Court of Honor) receives his 50-year certificate from Brother Roger Barnett, SGIG, Orient of Kentucky. Pictured above, Brothers Garry Kelly and Ed Tanner, KCCH, pose with Brother Roger Barnett, SGIG, Orient of Kentucky, and the other Brothers in attendance receiving their 50-year service award. Brothers and guests of Elvin E. Helms Lodge No. 926 met on October 11 for the Lodge’s stated meeting. Brothers Adam Gross and Sammy Meyerratken provided a fine chicken dinner for the evening meal. Our featured speaker for the evening was Ms. Shelly Hoxmeier, Director of the Family Resource Center for Kelly Elementary School. Ms. Hoxmeier thanked the Lodge for the bicycles donated to Kelly Elementary as attendance incentives and for the annual fund raising that we do to provide Christmas for certain students at the school. Ms. Hoxmeier informed the Lodge about the purpose of the Family Resource Center and about her duties as Director. Ms. Hoxmeier’s presentation provided some very timely and penetrating insights as to the challenges faced by students and school staff. Worshipful Master Ernie Stratton presented Ms. Hoxmeier with a Certificate of Appreciation for her services to the students of Kelly Elementary School. Join us on the evening of November 8, 2016 for our next stated meeting. Dinner will be provided by Brother Mike Boffemeyer. Business will include nomination of officers for 2017. 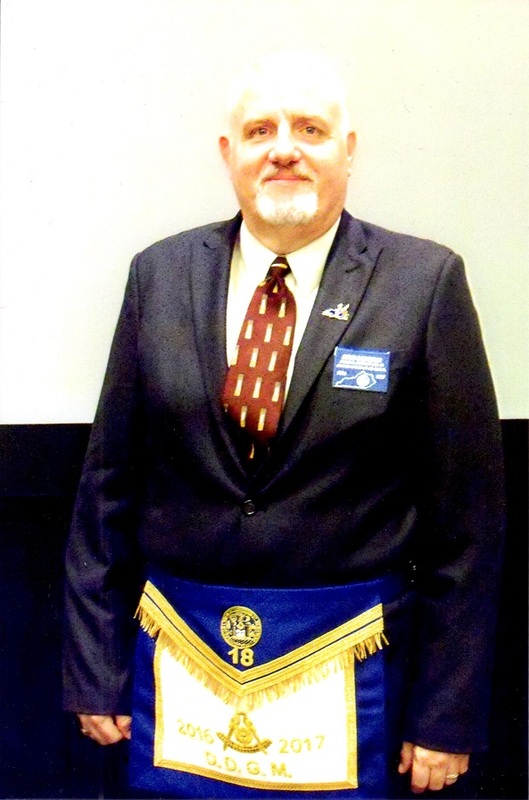 Our featured speaker for the evening will be Worshipful Brother Marc Rosen, Past Master of Poage No. 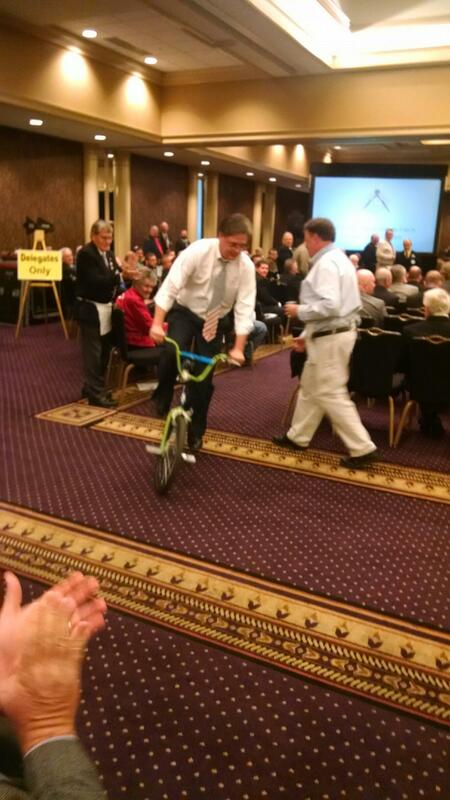 325 and former member (and chairman) of the Grand Lodge of Kentucky Committee on Appeals. 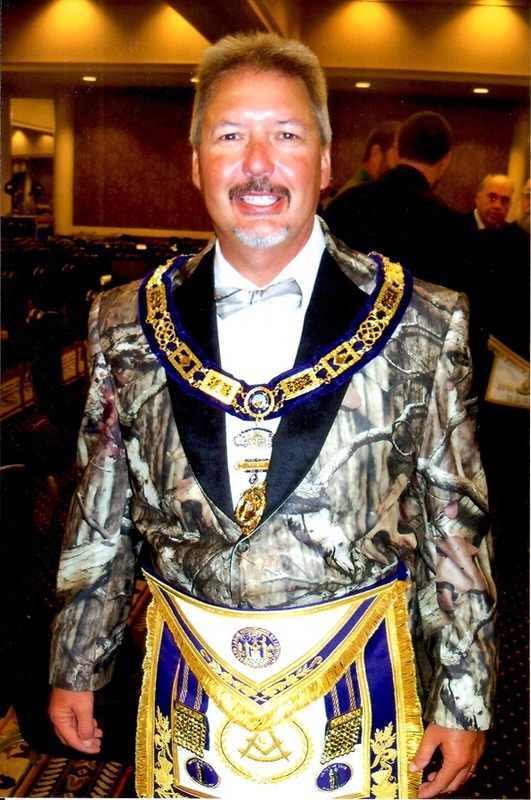 We invite you to click the link below to visit The Midnight Freemasons blog and read part 1 of this series by Illustrious Brother Todd E. Creason. The series focuses on what you can do as one Brother to bring Masonic Education back into our Lodges.